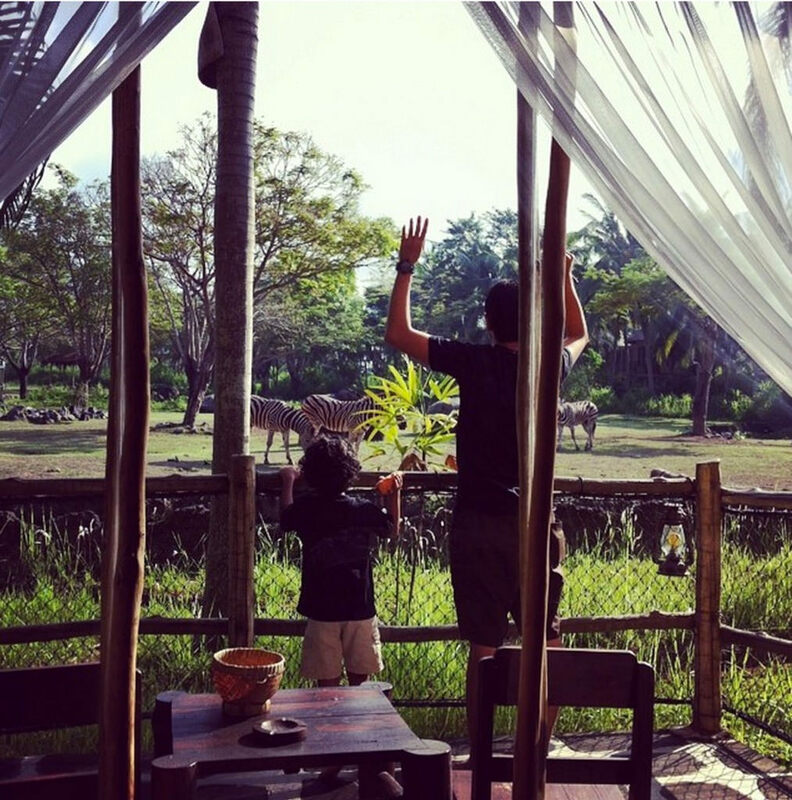 Have you or your kids always dreamed of staying in a safari and waking up to the lions’ roar? 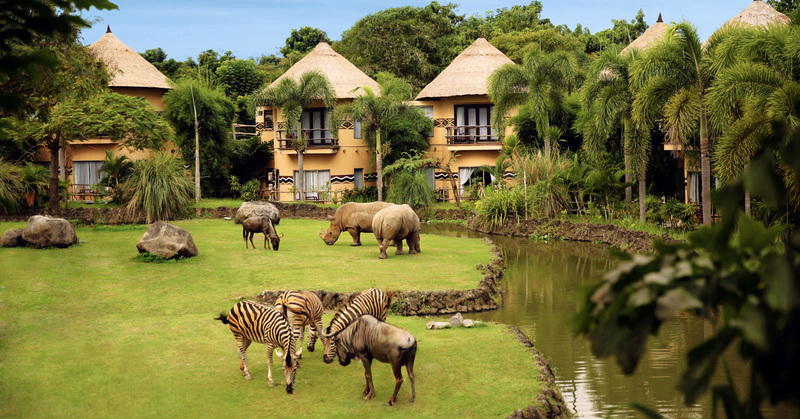 If you’re seeking an unconventional family experience, you’d love the Bali Safari & Marine Park, where you can eat, sleep and play with the animals. Jia Yi and I spent a good two nights at the safari resort, and there’s so many activities, it wasn’t even enough for us to savour it all. So be prepared – we’ll now share 13 unforgettable adventures you never knew you’d find there. 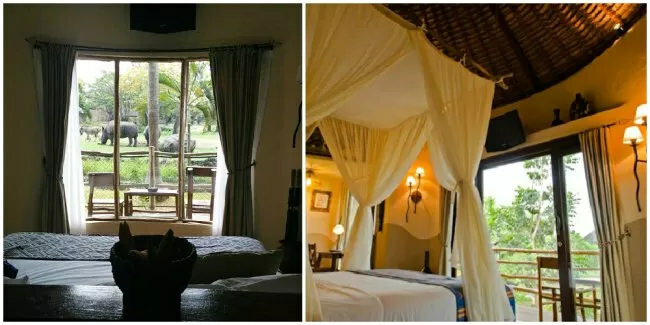 When dawn breaks, you can literally hear the lions roar and be greeted by the sound of birds conversing on the roof of your hut. Once you open your balcony doors, your neighbour is the zebra, grazing peacefully outside. 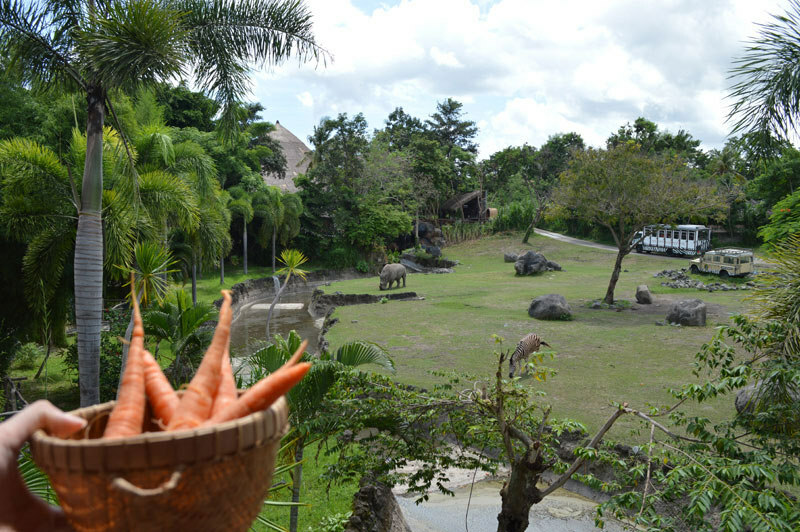 And guess what, you can even toss a carrot or two across the balcony and watch the zebras gallop towards you. A small tip for tossing carrots – break them into smaller halves so you can easily toss them across the mini river that separates the rooms from the animals. We’ve probably attempted more than ten times before we finally managed to swing a carrot across the mini river! Keep trying till you get the hang of it (great photo opportunities here) and don’t fret if you’re out of carrots – you can call room service to get more delivered to your room, for the price of absolutely nothing. 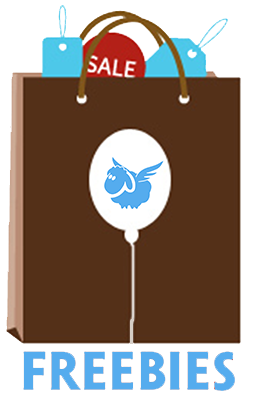 Rates starting from USD $148 a night (approximately Rp. 2,251,679). If all that jungle exploration has left you exhausted and in need a quiet moment for relaxation, try soaking in the pool for a view that differs from the usual sea horizon. Immerse yourself in the cold water to fend off the heat while gazing at the zebras and popular rhino couple Mrs and Mrs Nelson, as they go about their daily activities. We even spotted a few guests on their elephant back ride, and chatted with the elephant caretaker who brought us on our own elephant journey! For the ultimate pampering, indulge in some traditional Balinese massage. You can even get your nails and hair done at the Shifaa Spa! Join the lions for mealtime at Tsavo Lion Restaurant, where you are invited to watch these majestic creatures practise their catwalk right beside you. We couldn’t leave the restaurant without taking at least one selfie with the beauties, which stood still and posed for us! 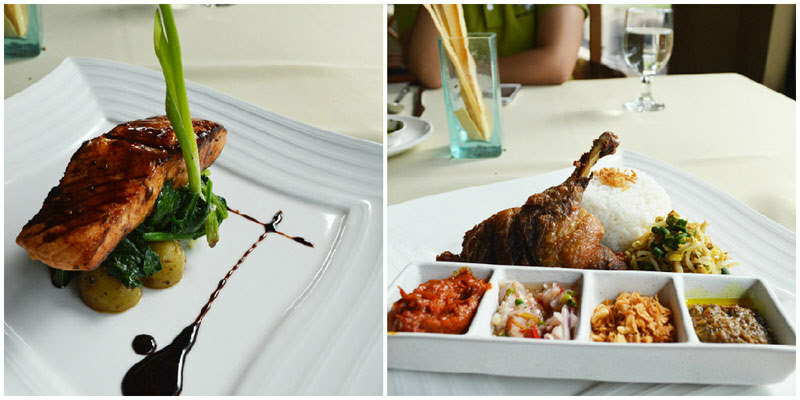 The restaurant serves up delectable meals ranging from western favourites such as Tasmanian Salmon (IDR 150,000/USD $11.50) to Balinese favourites such as Crispy Duck Leg (IDR 180,000/USD $14) that’s definitely worth a try. 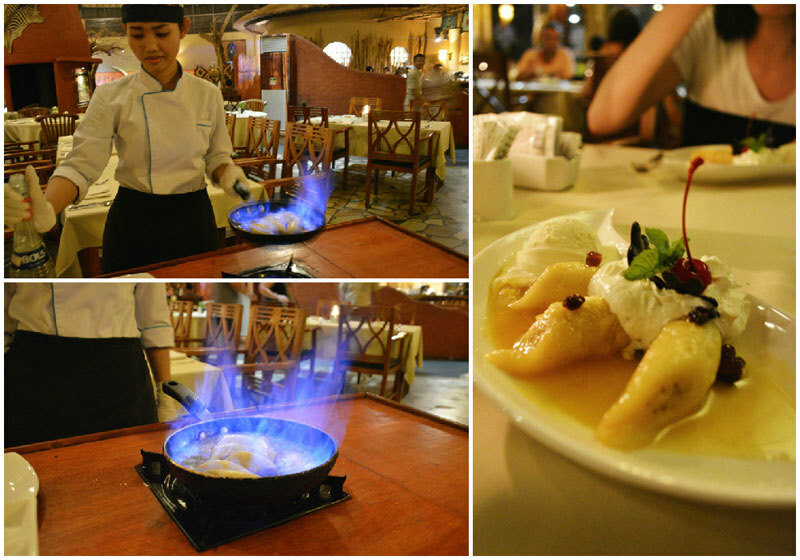 They even have a spectacular dessert – the Banana Flambé which is prepared by a chef right before your eyes. You might be expecting a mushy banana after watching the fire erupt from the pan, but the pleasing texture of the banana is actually adequately soft and not overdone. This is made complete with a scoop of vanilla ice cream – bound to delight your tastebuds! A kid’s menu is also available, with a range of options including soup, mains, sides and even dessert that’s almost as good as the ‘adult’ menu! 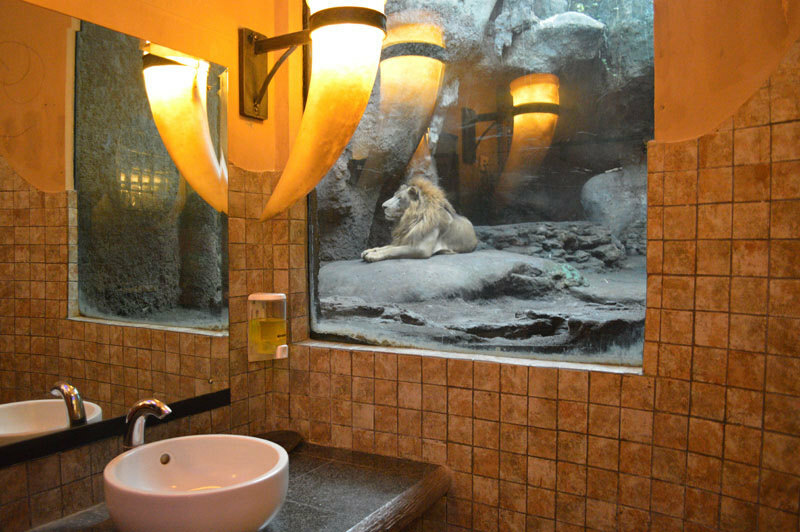 Be warned though – there’s a lion in the restroom that will watch you groom and freshen up after your meal! It’s talent-time – for animals to showcase what they’re good at! You can watch adorable guinea pigs and toy poodles run across the stage, and cats running up a levitated pole! Your kids will love to have a touch-and-feel of these furry little domestic creatures, and they can do so at the Petting Zoo. They’ll be delighted to watch these cute critters just an arm’s length away. 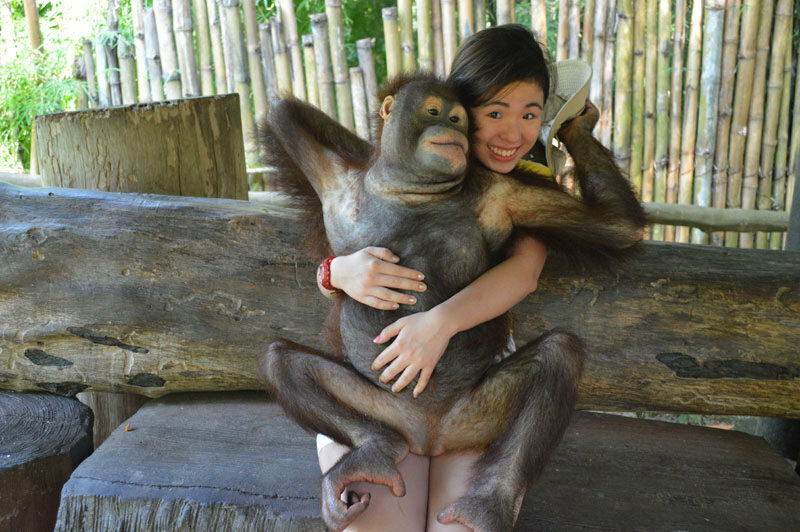 After the show, remember to head nearby to snap a picture with the playful Orangutan from the show. Be careful with your headgear though! The playful creature actually tried to sneak my hat away! Entrance to the petting zoo is included in every package. The animal show showtimes: Daily at 11am at Hanuman Stage (within the park) and an additional show on Monday at 3.30pm. 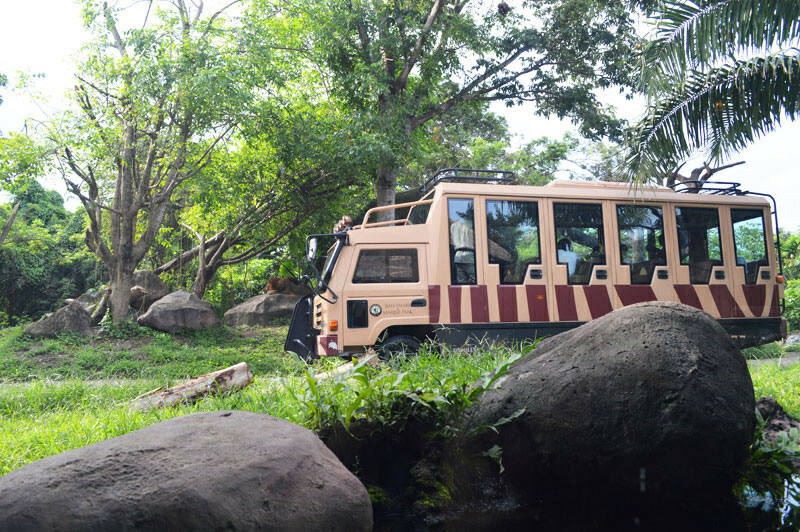 Experience the animals up close – instead of walking to different enclosures to peer at the animals, board a bus and be transported into their natural habitats. Unlike other similar safari journey experiences, what I loved most about this journey was the opportunity to encounter animals from Indonesia, India and Africa. We spotted docile Bambis, Ostriches, Giraffes, Lion Cubs and even a Leopard! 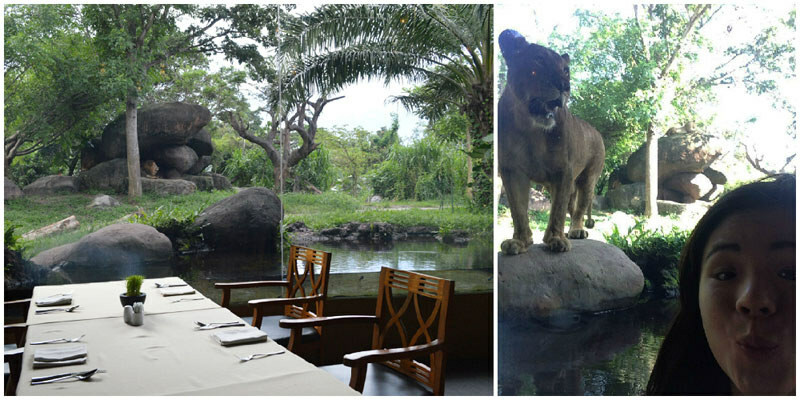 Separated by just a mere glass, you can imagine how kids squeal in delight as they watch the animals walk by, right beside them! We even get a chance to spot owls in their mini tree hole, in broad daylight. The bus travels across a bumpy bridge where your guide will encourage you to sing “Ahhhhhhh” in unison , the essential jungle song. 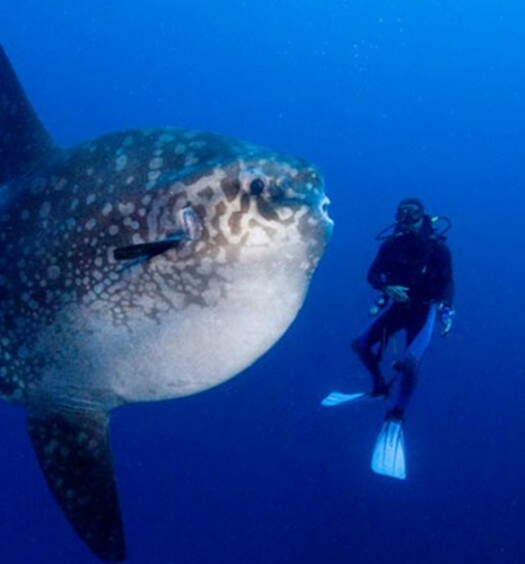 You’ll also get to learn interesting facts about these animals you see. If you’ve never been in such close proximity with animals before, this is definitely one bus ride you’ll be running to catch! 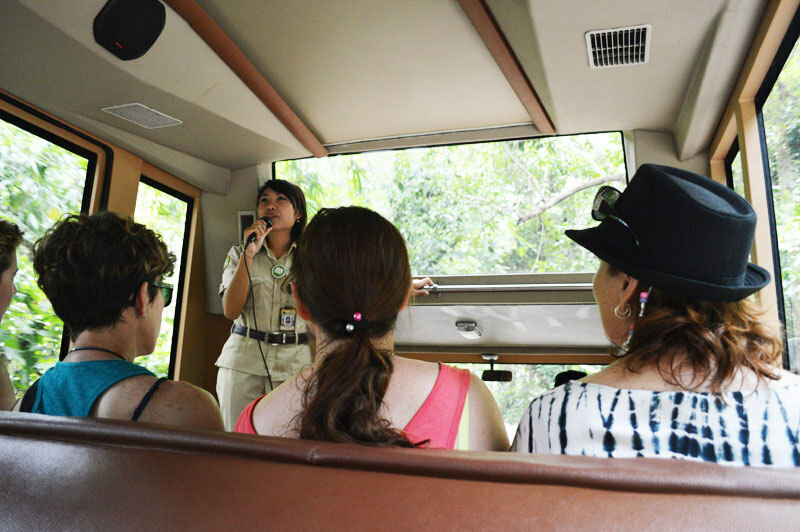 The Day Safari Journey bus ride is included in every package. Can you imagine a role reversal – you’re now in the cage, and your hungry carnivorous predators outside, drooling at you through the bars? 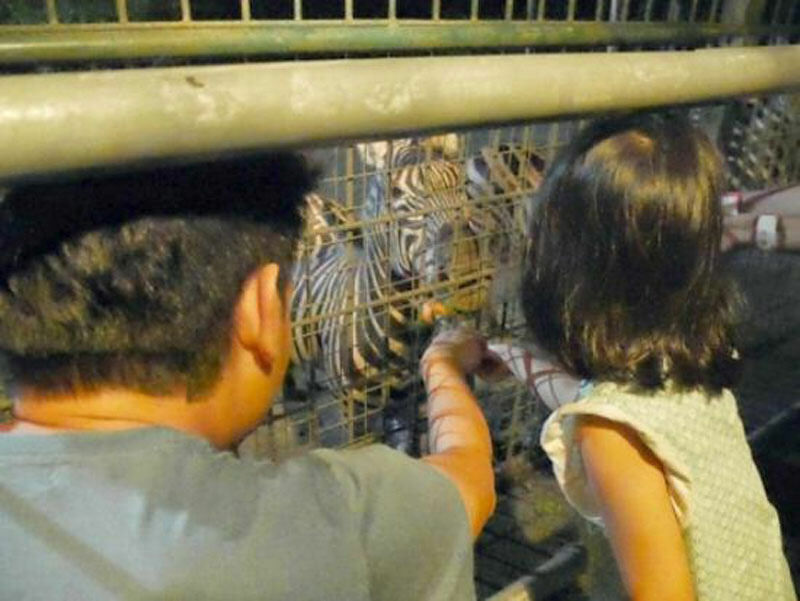 In the Night Safari Journey, you’ll get to experience the most thrilling experience at the safari park. You step into a cage-bus equipped with snacks (for the animals), and it sets off into the dark jungle surroundings. The bus stops by at various pitch stops where the clever animals advance towards the cage at the aroma of carrots (or perhaps humans?). You can feed the friendly elephants and zebras, which will gnaw on their little treats happily. When you see the huge gates, and as the cage passes two of these safety barriers, you know that something is amiss – danger is looming. And sure enough, the bus has entered the Tiger’s Den. If you have young kids with you, please ensure that they don’t stick anything out of the cage! 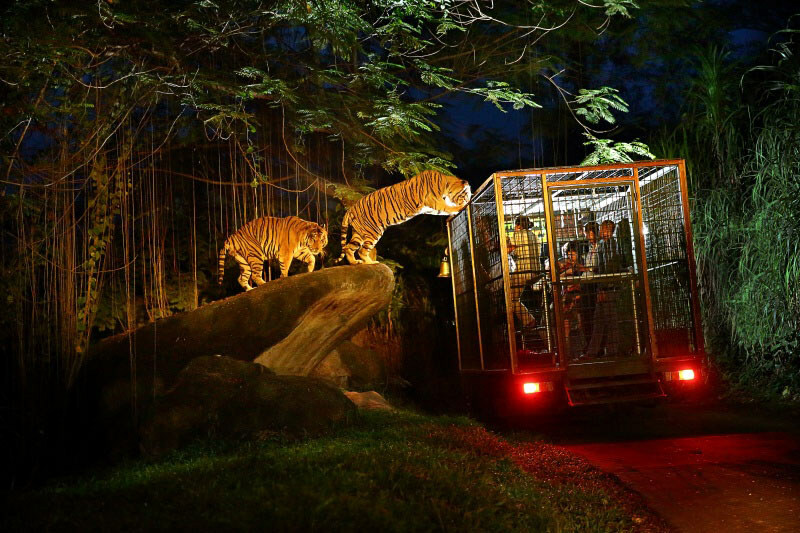 At that moment that the cage-bus comes to a halt, and a tiger pounces up onto the cage. We actually felt its saliva raining down on us as it gobbled up the meat offered by a park ranger. And of course, how can we forget to insta-worthy video this moment? This is the utmost closest you can ever get to a tiger, without you becoming its next meal! A clever fusion between traditional storytelling methods of puppetry and modern day theatre, Bali Agung showcases the most popular folktale in Bali. The story tells of the 12th century King Jaya Pangus and his marriage to a wealthy Chinese merchant’s daughter, Kang Ching Wie. 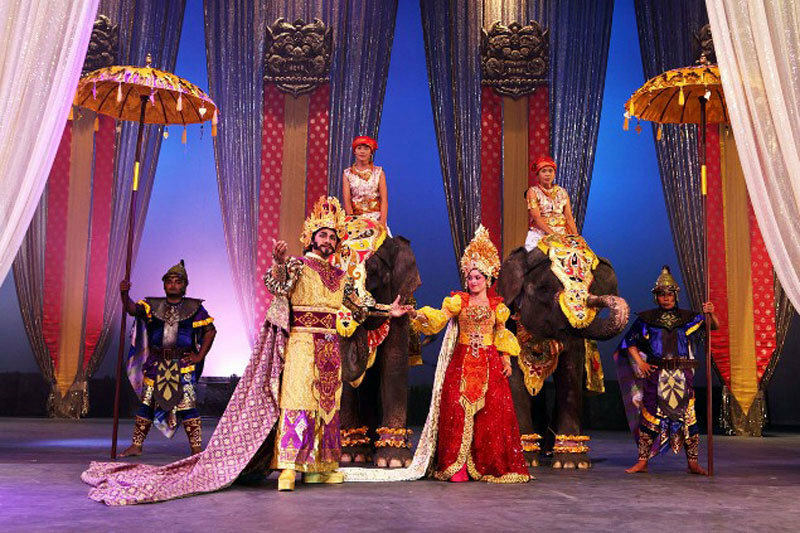 The glorious display of dance and beautiful stage set-up showcase the integration of both cultures, as well as village life in the old Balinese days. And with every story, there’s always a twist. On a voyage one day, the King is shipwrecked, and ends up on an island. He fell in love with the beautiful goddess of the lake, Dewi Danu, who’s dressed in a majestic gown 10 metres long. You’ll watch their love affair play out, accompanied with the severe consequences of the King’s mistake. But this is not just a show about humans. 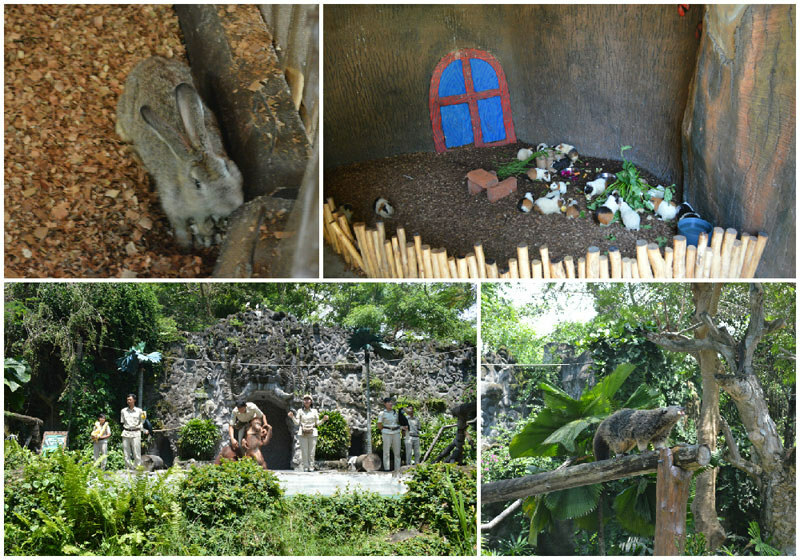 Naturally, with the theatre located in Bali Safari & Marine Park, the animals have a role to play too! Performed in the biggest theatre in Bali, Bali Agung has passed it’s 1,000th show in June 2014 with a cast of over 180, including musicians that are masters of traditional balinese instruments that help add atmosphere to the show. 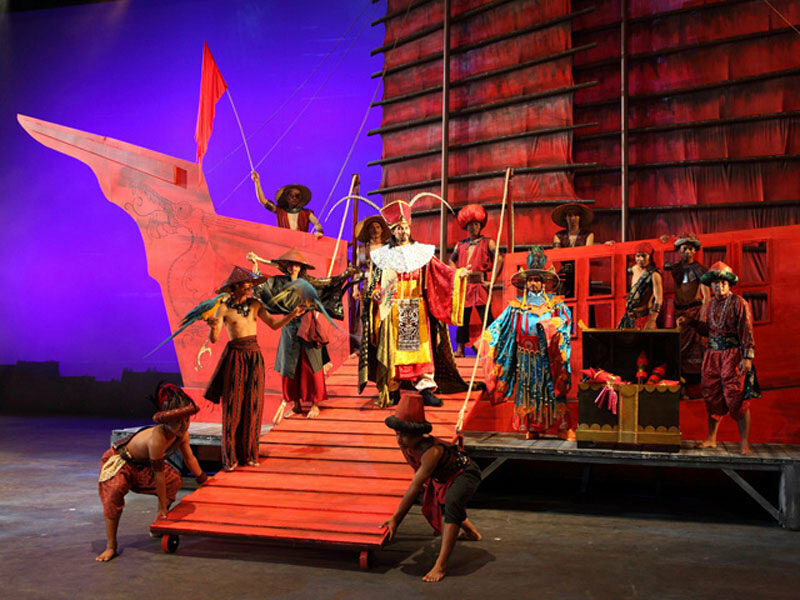 With handmade costumes and props – including the giant ones such as the dragons and even a ship, the show is indeed a unique theatre production that’s worth every cent! The Bali Agung Show is included in every package. Showtimes: Tuesdays – Sundays, at 2.30pm. Performance lasts for 1 hour. 8. Watch the elephants display their talents. 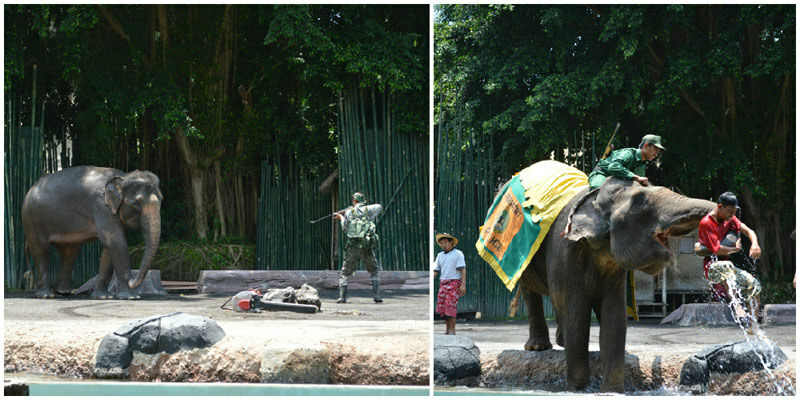 At Bali Safari & Marine Park, you can head on to the show area, where you can watch the elephants display their talents. You’ll also learn more about the history of the conflict between elephants and humans, and better understand the importance of saving the homes of these beautiful creatures. The elephant show showtimes: Daily at 11.45am & 4.30pm at the Elephant Stage at Kampung Gajah (within the park). Incorporating one of the park’s main theme, Africa, the display of fire and dance gives a peek into African culture with a Balinese twist. 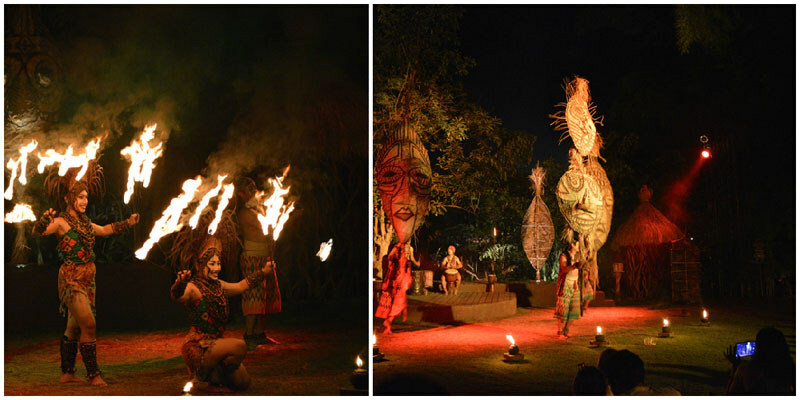 Under the starry night sky, you’ll watch passionate dancers and stuntmen enter the scene and present a tribal dance – accompanied with drum beats and all the yelling you would expect. Definitely a show that your kids will love to see, as the sparks light up the stage in a dramatic flourish. You can even stay back to take selfies with the cast! 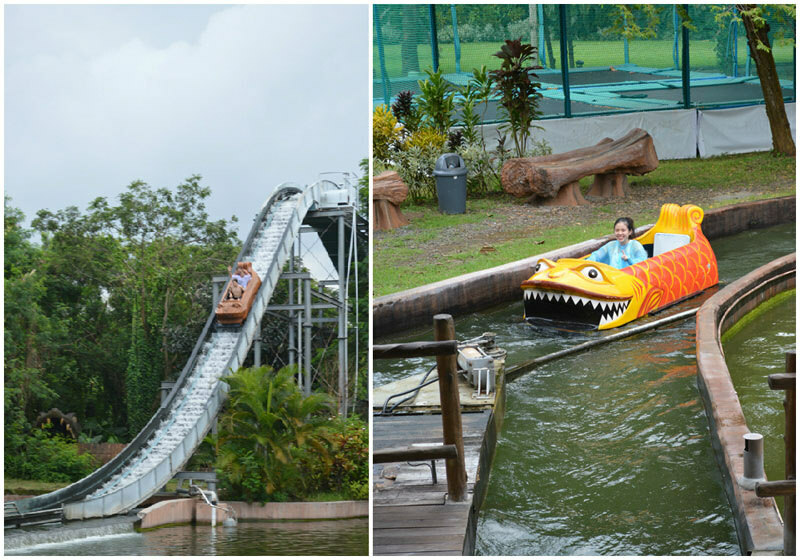 The Safari and Marine Park doesn’t just house a zoo, but a mini theme park too! 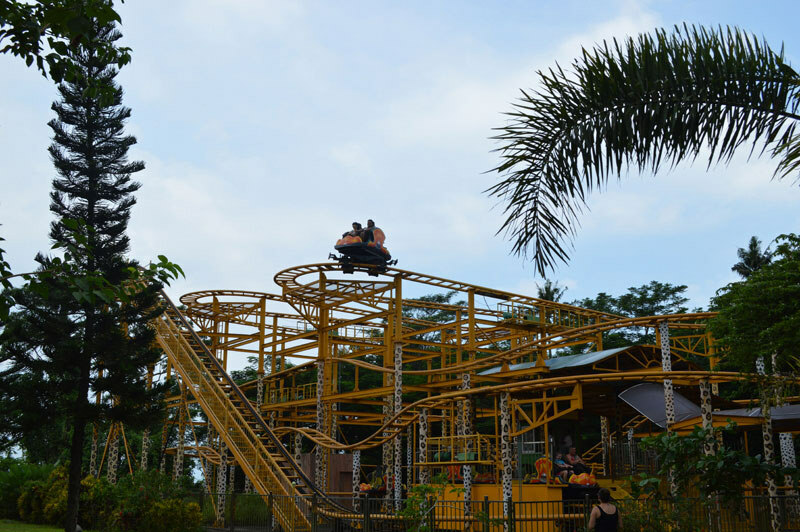 Your little ones will go gaga over the Merry Go Round and Climbing car, while your older kids will get addicted to the more thrilling rides. 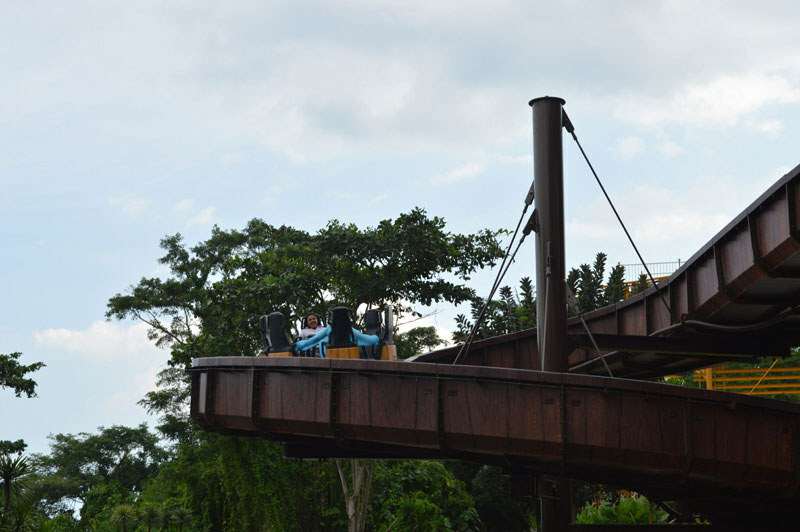 If that’s not thrilling enough, try the flume ride, which sends you escalating down to a big splash! And a new ride, the hydrolift, sends you spinning downwards so rapidly that will get your heart racing. Just a tip – if you’re an adventure seeker like me but hate getting wet, there’s no reason why you should forgo the fun on water rides all the same. Just put on a raincoat! 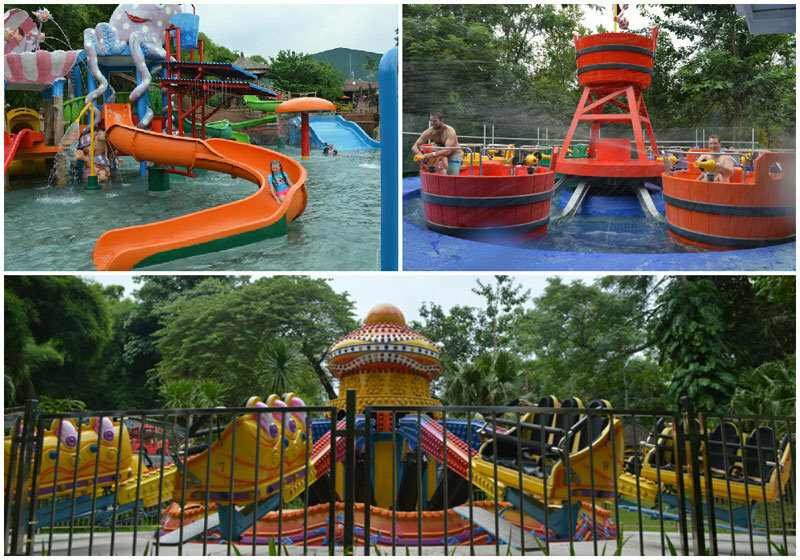 If your kids love to thrash around in water, there’s a water playground that will keep them occupied while you soak in the pools or catch up on some swimming. 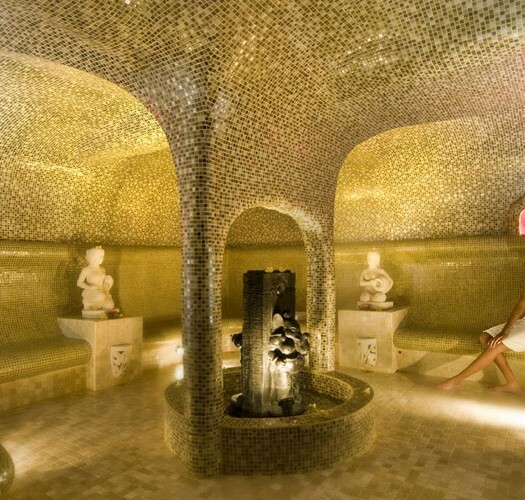 Definitely one of the best ways to cool off in Bali’s humid heat. 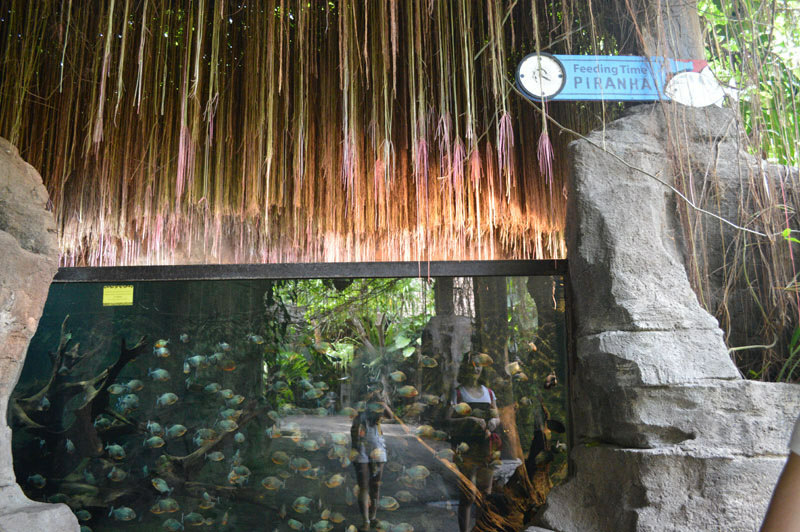 Not everyone has the chance to see a tank full of piranhas. These tiny but aggressive creatures they stay in position like a perfectly painted picture – until mealtime. And you can witness them devour a whole chicken in less than five minutes! We were told that when these carnivorous creatures get too hungry, they even attack and consume their tank-mates! 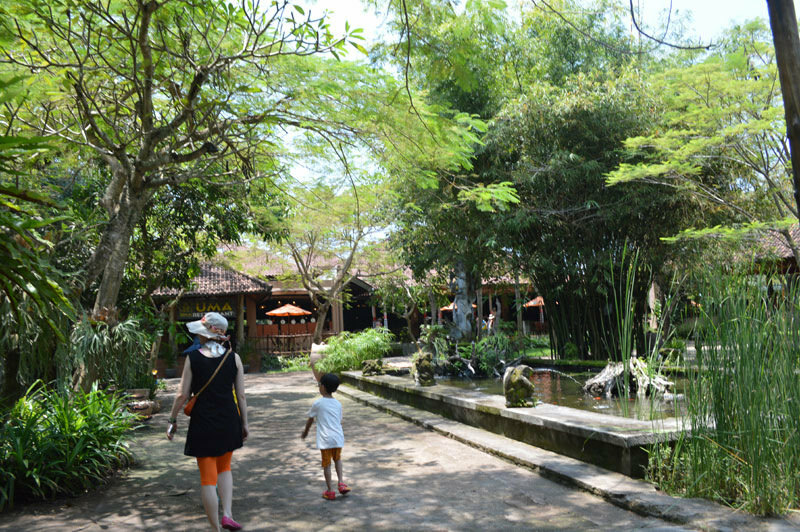 You’ll be transported back in time at the Bali Village in the park, which really reflects the days of Old Bali. And you’ll never believe this – free traditional Balinese dance lessons are actually available! 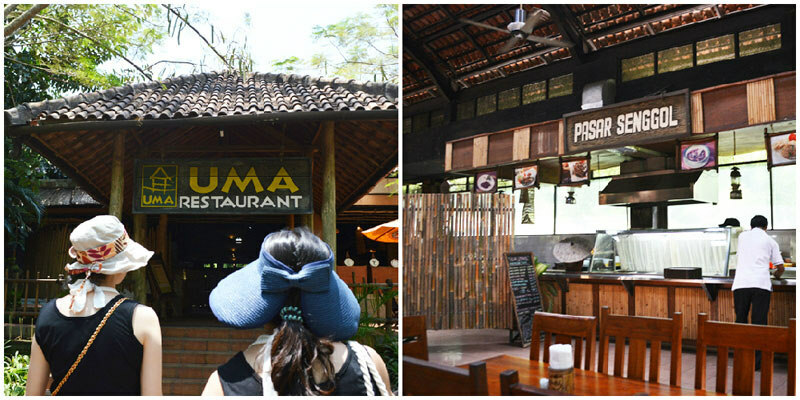 All you have to do is to approach the staff at the hut located near Uma Restaurant to learn the dance. You can learn from masters of the art who’ve been at it for years, and bring home what you’ve learnt as a unique souvenir. You’ll also find admirable handmade costumes and characters along the way. 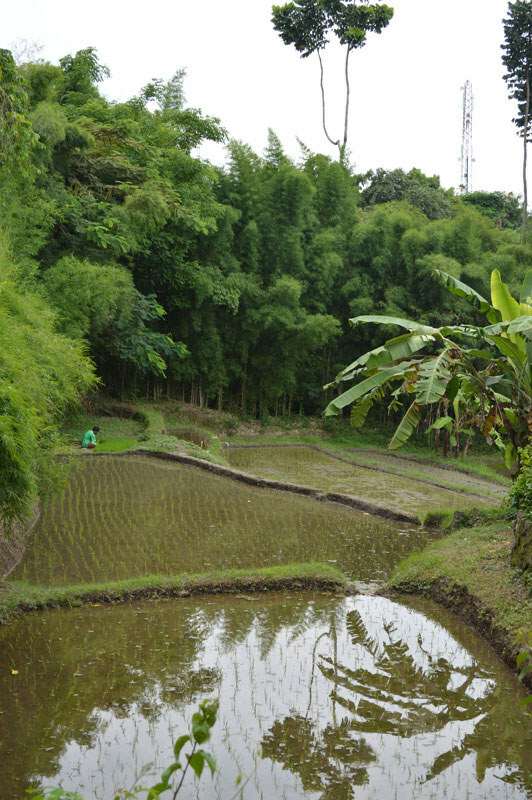 Bali is well known for its rice fields, and this view is what you’ll get while dining at the balcony of Uma Restaurant. Right outside the restaurant, there grows rice that’s probably used in the restaurant! As this was one of our first experiences with rice fields in Indonesia, we were unknowingly captivated by the work of a farmer, as he went about his daily care routine for his precious crops. With a variety of food choices ranging from Indonesian cuisines to Italian favourites such as pasta, we were honestly spoilt for choice! 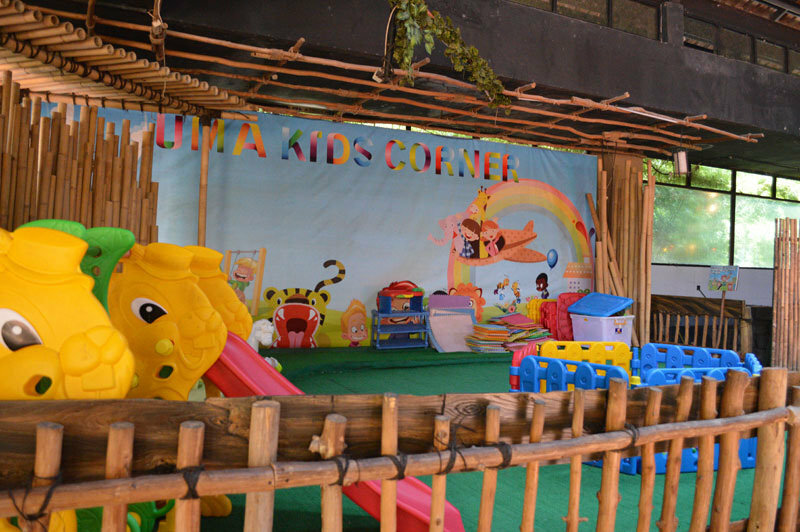 There’s even a play area to keep your kids entertained while you slowly enjoy the delectable dishes. Getting there: An estimated 45 minutes (without traffic) from Ngurah Rai International Airport, drive along Jl. Airport Ngurah Rai, continue straight onto Jl. Akses Bandara Ngurah Rai and Jl. Airport Ngurah Rai, got through a roundabout before proceeding to take Jl. By Pass Ngurah Rai to Jl. Prof. Dr. Ida Bagus Mantra in Medahan. 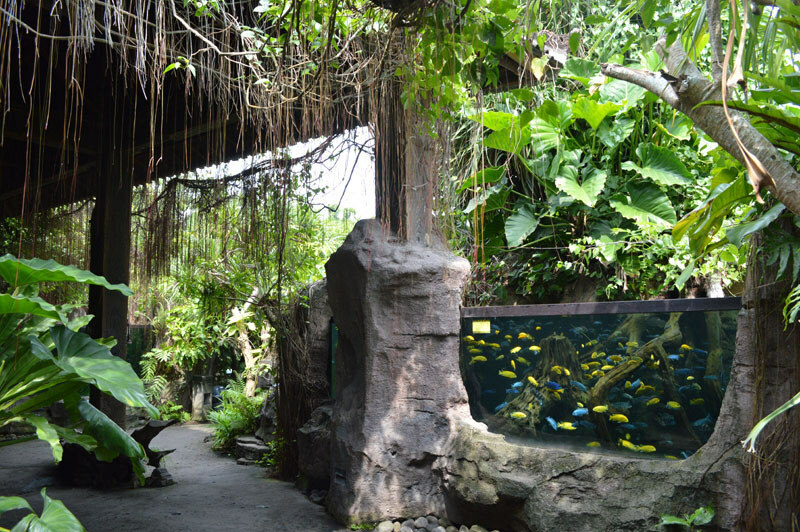 What do you think about our Bali Safari & Marine Park review? Let us know in the comment section below! 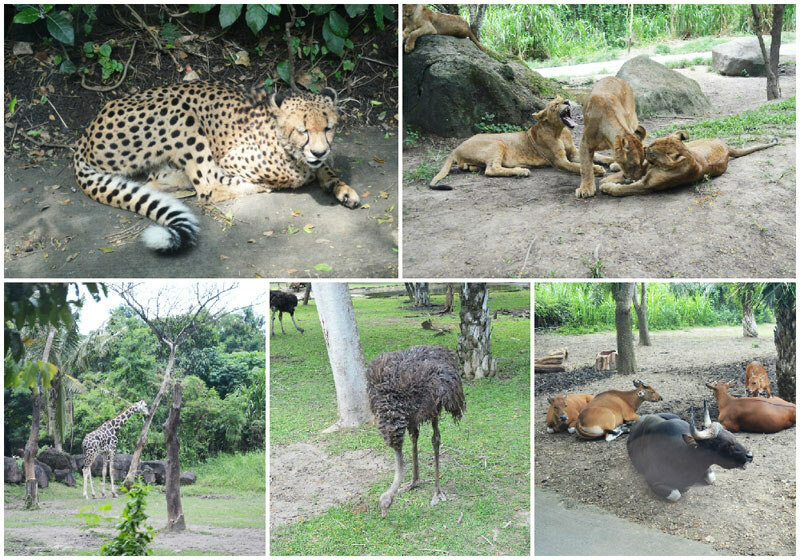 This article is brought to you by Bali Safari & Marine Park.